Thank You Lord for Your grace, Your great mercy, and loving kindness. All of these we don’t deserve, yet You still love us all the same. I wrote and shared a lot on repentance last year, and The Lord has put it on my heart to share these Words again. I woke up waiting to hear what The Lord has to say this morning, and He took me to Job 11 and it spoke on repentance, so I knew it is The Lord’s desire that His children repent for He is as He said through a minister at church on Sunday The God of another chance. The Israelites sinned against God over and over again, despite all the awesome wonders that they had witnessed of The Lord. The Lord was angry with the Israelites, He had had enough of their rebellious ways. When I read this scripture I was thinking to myself why did the Israelites keep rebelling against God? After all every time they cried out to The Lord He answered them, despite all they had done He still faithfully freed, saved, delivered the Israelites. Then I realised we are no different. How many times have we offended, ignored, and rebelled against God? Countless. Before you sin just stop and think is it worth it? I’m speaking to myself as well. The Lord said the wages of sin is death, is it worth choosing death over eternal life? Was it worth the Israelites rebelling against God only to wander 40 years in the desert before entering the promised land, and when they entered the promised land they continued to rebel against The Lord only for them to suffer in the hands of their enemies for eighteen years. We must intercede for the salvation of our land. Sin may be the easiest option but it has the deadliest consequences. Sin weakens the Holy Spirit living inside of us and strengthens the flesh, the flesh which God Himself said will not enter the kingdom of heaven. He is always willing and ready to receive a repentant heart. A repentant heart desires to flee from sin. A repentant heart does not desire to remain in sin. We ought to be so grateful for the sacrifice that Jesus made, He constantly intercedes on our behalf. We need to forgive those who trespass against us, as He has forgiven us. If you’ve been hurt, if you’ve been offended speak to God, tell Him how you feel, pour your heart out to God. Others may just not get it, they may not understand what you’re going through but God does. You’ve been hurt forgive and be free from the pain, why should you be the one to suffer? Let God judge the situation, allow God to take control. When the enemy tries to fill your heart with resentment, anger, and bitterness simply rebuke him. God has given you the spirit of joy, of love, and of a sound mind. You know I shouldn’t really be surprised when a brother or sister in Christ offends me knowingly or unknowingly it’s bound to happen. Who knows the amount of people that I’ve offended without even realising it. That’s why we ought not to put so much expectation on man, or on the church you’re better of putting your total trust and hope in God. I mean all we need do is read the bible to see the numerous amount of people that hurt and offended Jesus, even His own people even in His own town and despite all that The Lord has done people are still offending Jesus now. Oh lord Your love really amazes me, Your love is really unlike any other. How many times have I offended Him by disobeying His Word? Yet He still loves me, I repented and He forgave me. You see being a Christian is not about being selfish it’s about being selfless. Being a Christian is about serving others in love, by doing so you are serving The Lord also. If it wasn’t for His blood there would be no redemption only condemnation. Through Jesus Christ we have become a new creation, old things have passed away. That old self, that old attitude, that old sin have passed away. Now that we are in Christ Jesus, He has taken away the shame. When we find ourselves back in old things(sin), We Must Not Stop Asking God For Forgiveness. God will never stop forgiving us, because He will never stop loving us. It’s only over when we refuse to repent. Jesus bore our old sins on that old rugged cross. So I’ll cling to the old rugged cross, we are like Christ therefore we all have our own cross. We are all facing old sins, but Jesus took away our sins, and like Jesus we have the power to bear that cross and OVERCOME our old sins, and when we do our trophies at last we will lay down. If you desire restoration, if you desire righteousness, if you desire repentance, then please pray this prayer with me. 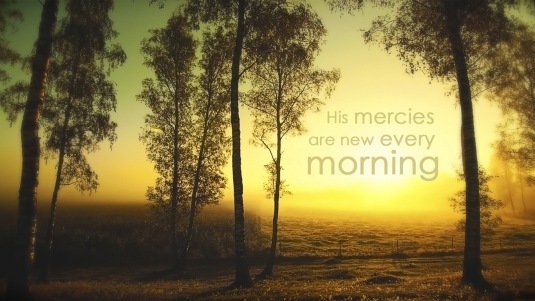 Great is His mercy to give you another chance. For He is the God of another chance, and indeed there is no one like Him. Sometimes I just can’t find the words, sometimes there is no one to turn to, but God I know I can always trust and confide in you. Lord I come before You with a humble and honest heart. I know I won’t always get it right, I know I am bound to make mistakes. God I know You understand, and Lord all I want to say is please help me, restore, and forgive me. Lord even the things that I don’t know of please forgive me. Lord all I want to do is serve You, and I know that You know that I’m not always going to get it right all the time, You know I don’t always have it together, which is more the reason why I need You always. Lord you know what my struggles, weaknesses, fears, battles are, and You know how one day I want to help others, especially those whom have gone through the same thing as me, and Lord I know the more I serve You the more the enemy fears me and that’s why he tries to strike these burning arrows of sin at me, that’s why he tries to discourage me, but Lord I know you’ve always got me, and I know no matter what I can always run back to You. Lord help me to understand the meaning of true repentance, for I know the old me died when I became born again, and I know that now I’m born again I have inherited Your kingdom, so Lord I don’t want to keep falling back into the same sin over and over again, for I know to constantly dwell in sin is not true repentance, I must flee sin, and die constantly to the flesh. Heavenly Father I’m done trying to figure out why I’m having to go through this, but Lord You said that there is nothing that You give that is too hard for us to handle, and so Father I’m not gonna quit. For I know from where I’ve started from I’ve come a very long way. Though Lord there have been slip ups, Your love has never failed me, and has encouraged me to get back up. I know Lord that everyone goes through something, even though it may not seem that way I know they do, just as someone may think I’m not going through something, but Lord You know for You are Lord of All you are The Messiah. I’m sorry for hurting You, I’m sorry for forgetting, I’m sorry for everything Lord. I couldn’t find the words, but Lord all I want to say is let there be a true change in me, let there be a true repentance. Lord transform, and mould me into Your likeness every day, because I need You every hour, every minute, every second of my life Lord. I love You, I thank You for never giving up on me. The constant chances You’ve given me is enough reassurance of Your constant love, and is a reminder that You have given me purpose. We’ve just got to be honest and open with Him, for His love is great and His mercies endure forever. Thank You Lord for Your Word, it has really encouraged me. I pray that this Word shall minister to someone as it ministered to me. Wow! This is the message I needed this morning. Few days ago I wrote about His mercy and I am yet to publish it. Today, I woke up and first words in my spirit were ´true repentance´. It´s amazing to stumble into this. May God richly bless you Samantha. Continue yielding to His will and I pray He continues strengthening you daily. May the fire inside of you never quench. I love the way He reveals His Word. This Word must be prophetic and I thank God.